The Mesoscale and Microscale Meteorology Laboratory (MMM) has a history of providing real-time numerical modeling and weather forecasting in support of scientific field campaigns. These services have contributed to the improved use of observing facilities (e.g., aircraft) and to the enhancement of the science. To assist investigators, program managers, and facility managers, this page summarizes the modeling and forecasting capabilities that MMM can offer for field experiments. To inquire about these services, principal investigators and other campaign personnel can provide initial information to the MMM modeling contacts (listed below under "Information for Principal Investigators") via the form under the "Contact" tab above. Real-time NWP by MMM for field experiments began in 1992 with STORMFEST (Storm Fronts Experiment Systems Test), and many efforts have followed (Table 1). Given campaigns' constrained resources and time windows, they are stern testbeds of scientific project planning and execution. To increase the odds of their success, numerical models and weather forecasts can support the field activities and subsequent analyses. These applications also provide excellent settings for model evaluation, and the model understandings and improvements that can result can greatly benefit their broader user communities. MMM’s forecasting support can directly contribute to the success of a campaign, making more productive use of the facilities and of the personnel time. In addition, it can improve the relevance and value of the data collected. Furthermore, the scrutiny of the models can reveal areas for their improvement. The MM4, the MM5, WRF, and MPAS have all served field campaigns and have been advanced by them. MMM offers modeling and weather forecasting support for all experiment phases. In the planning stage, model simulations can yield better understanding of the regional meteorology and can guide mission configuration. During the experiment, the real-time setups can supply tailored products, and MMM can deliver valuable forecasts and briefings. While the interaction with the mission personnel is most effective if done in the field, the work can also be conducted remotely if budgets do not support the necessary travel. Lastly, after the field phase, simulations can aid investigators in analyzing collected data and can support process/event studies. Compute resources are essential to the NWP support. The community machines at the NCAR-Wyoming Supercomputer Center (NWSC) are the most capable resources, but for this core-hours must be allocated. Ideally, this is considered in early planning for facilities. The core-hours may be budgeted in the PI's experiment proposal, in experiment-linked proposals, or through a request from the MMM laboratory compute allocation. MMM’s expertise in modeling and data assimilation systems helps PIs and campaign planners, as its scientists can best implement the systems and explain the model output. Their direct support offers that expert advantage, reflecting extensive modeling and campaign forecasting experience. Campaigns employing aircraft (and particularly studies in which the PIs may not have much meteorological analysis or weather forecasting experience) can greatly benefit from forecasters using tailored NWP systems and products. Accurate weather forecasts can help the project in capturing the conditions in the target areas; in avoiding waste of flight time, support facilities, and other resources; in optimizing personnel time; in maximizing the data yield of limited flight hours; in allowing multiple investigators to meet diverse scientific objectives; and in contributing to the safety of mission personnel and equipment. The investment in this weather forecasting support can easily return more than it costs. Models such as WRF and NCEP’s GFS have been used in NCAR modeling and forecasting support efforts for a number of campaigns using the NCAR GV aircraft. Examples are START08 (Stratosphere-Troposphere Analyses of Regional Transport 2008), TORERO (Tropical Ocean Troposphere Exchange of Reactive Halogen Species and Oxygenated VOC, 2012), SEAC4RS (Studies of Emissions, Atmospheric Composition, Clouds, and Climate Coupling by Regional Surveys, 2013), CONTRAST (Convective Transport of Active Species in the Tropics, 2014), and ORCAS (O2/N2 Ratio and CO2 Airborne Southern Ocean Study, 2016). CONTRAST was an NSF-sponsored campaign based out of Guam using the GV for chemical sampling, and MMM ran a 15-km/3-km WRF system for flight forecasting. Figure 1 presents an example of guidance from CONTRAST, in the form of forecast 3-hourly precipitation and sea level pressure for the study region. Fig. 1: WRF domain (15-km) configured for the forecasting support of CONTRAST. 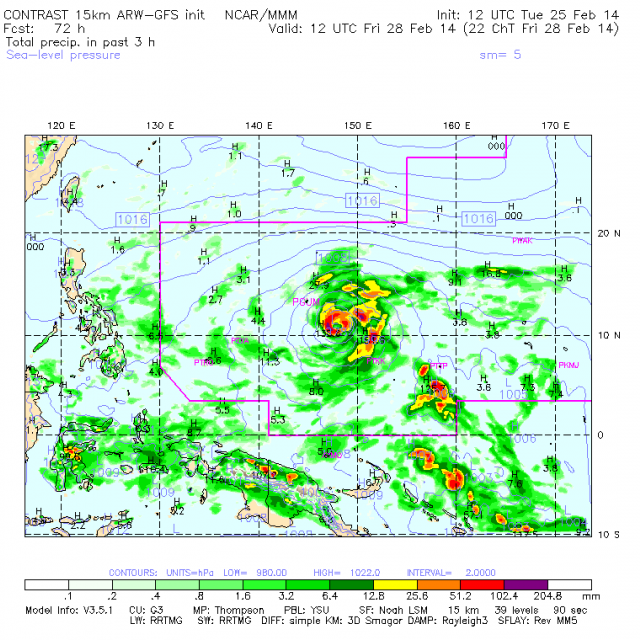 72-hr forecast of SLP (contour interval= 2 mb) and 3-hourly precipitation (mm, shaded, scale at bottom) shown (1200 UTC 25 Feb 2014 initialization). Purple boundary marks the Oakland flight information region (FIR). In ORCAS (2016), WRF output assisted the GV measurement flights by providing guidance geared to the varied observation goals. Given the Southern Ocean target area, MMM leveraged the output of the Antarctic Mesoscale Prediction System (AMPS), a real-time NWP capability run by NCAR that serves the United States Antarctic Program. 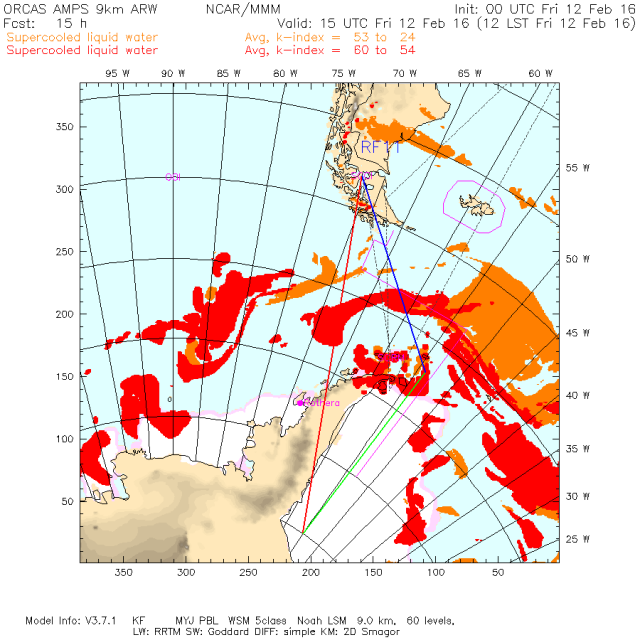 Figure 2 presents examples of WRF guidance for ORCAS and the GV flights out of Punta Arenas, Chile. One concern for the aircraft was supercooled liquid water, and Fig. 2(a) shows a model forecast of this at low levels (to 500 ft AGL (red); 500‒1000 ft (orange)). Turbulence was also an issue, and Fig. 2(b) shows a forecast of clear-air turbulence and supercooled liquid water on a cross-section along 55°W (from 55°S 55°W (left) to 70°S 55°W (right)). 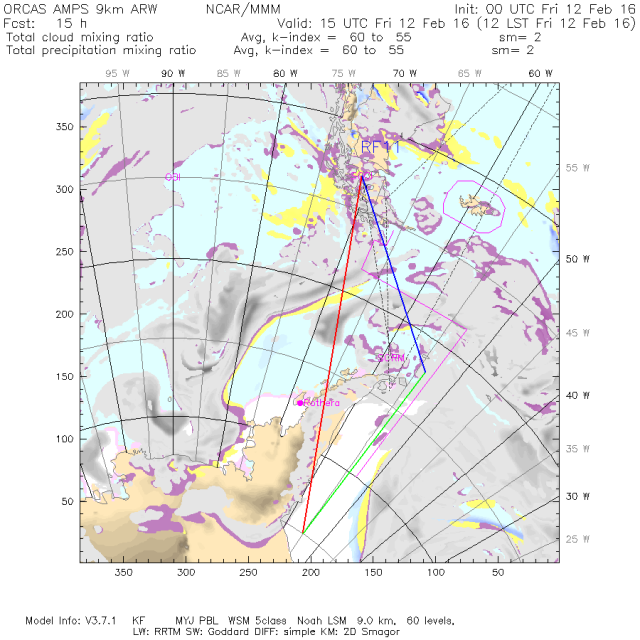 As low-level clouds were also important for flying and chemical sampling, customized plots of forecast cloud with flight paths and ice overlain were also provided (Fig. 2(c)). In addition to supporting the data collection needs, WRF forecasts of surface winds helped in repeated evacuations of the GV from Punta Arenas to a safe alternate airport because of high wind episodes. Fig. 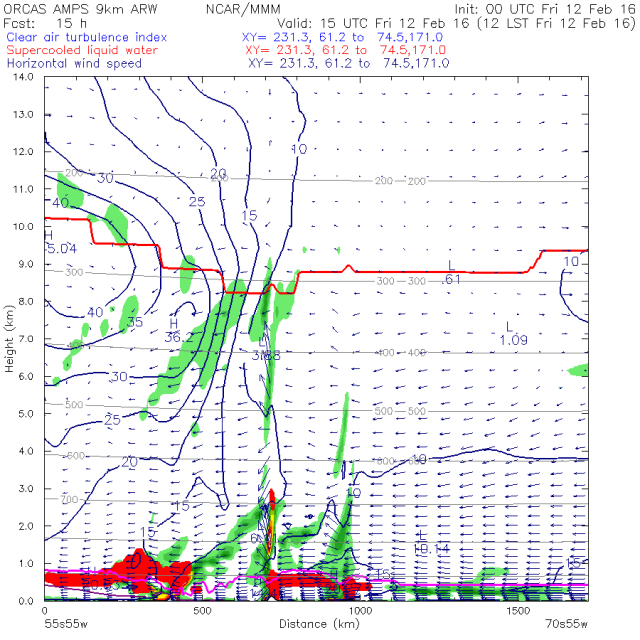 2: WRF forecast plots in support of ORCAS. All plots represent forecast hr 15 of the WRF run initialized 0000 UTC 12 Feb 2016 (valid 1500 UTC 12 Feb 2016). (a) Supercooled liquid water up to 500 ft AGL (red) and from 500‒1000 ft AGL (orange). (b) Cross section of supercooled liquid water (shaded), clear air turbulence index (contoured, blue), horizontal wind speed (vectors), PBL height (single magenta contour), and tropopause location (single red contour). (c) Cloud and precipitation mixing ratios to 500 ft AGL. Line segments mark projected flight paths. White shading around Antarctic Peninsula represents ice edge. Through experiments such as these, MMM has developed significant experience in science flight planning. When combined its the tailored NWP systems and products, this support can help PIs meet flight-hour data collection and aircraft usage goals and optimize the value of their measurements. The application of state-of-the-art data assimilation (DA) approaches and systems can improve NWP guidance for field campaigns. MMM has been a leader in DA research and development and can apply various DA approaches for model initialization, depending on experiment needs and resources available. These include: 1) 3DVAR, 2) 4DVAR, 3) EnKF, 4) Hybrid Variational/Ensemble DA, and 5) Radar and convective-scale DA. Having a data assimilation component in the NWP for campaigns can provide value to the experiment before (e.g., in planning), during (e.g., in mission/observing period forecasting), and after (e.g., in analysis/research) the field phase. In addition, the real-time application can be a testbed for the evaluation and improvement of the DA capabilities used. Experiments for which MMM has had DA efforts include DC3 (Deep Convective Clouds and Chemistry Experiment, 2012), MPEX (Mesoscale Predictability Experiment, 2013), and PECAN (Plains Elevated Convection at Night Experiment, 2015). For DC3 ensemble analyses and deterministic WRF forecasts run with chemical tracers supported both the preparation and field phases. For MPEX a WRF ensemble analysis and 30-member ensemble predictions were produced twice daily. And, for PECAN an analysis and 10-member ensembles were produced daily. Furthermore, since 2013 rapid-update (e.g., hourly initialization) data assimilation experiments have been conducted each summer over the Rocky Mountain Front Range to support hydrological prediction in NCAR’s STEP (Short-Term Explicit Prediction) program (STEP Hydromet). The goal there has been to improve model quantitative precipitation forecasts through enhanced initializations from assimilating Doppler radar observations. MMM can provides a range of numerical modeling and weather forecasting services in support of scientific field campaigns, and past efforts are listed below. It has experience in experiment forecasting around the globe, and investigators and facility coordinators can exploit this expertise by including real-time NWP support in their planning. This information should be of interest to principal investigators, program managers, and scientists involved in experiments that utilize NSF and other observing facilities. Please note that the earlier that MMM can become involved in a campaign, the better will be (i) the preliminary modeling for planning and (ii) the field-phase forecasting for the science missions. Certain campaigns, such as those with aircraft or marine operations, can benefit greatly from the modeling and forecasting, as the resources are tightly-controlled, time-limited, and expensive to deploy. We strongly recommend that interested principal investigators (PIs) account for forecasting and model analysis services in their proposed work. For imporved planning and increased chance of funding, the support sought (e.g., preliminary modeling, forecasting, post-campaign analysis) preferably should be described and budgeted for in the initial project proposal. Including it at the outset will strengthen proposals as well as avoid difficulties from seeking extra funding from agency program managers after project approval. PIs should contact the contact MMM scientists listed below for further information. They can work with the PIs to determine what might be best for the proposed effort and can provide written descriptions and cost estimates. The "Contact" tab at the top of this page provides a form for providing basic initial information for inquiries.